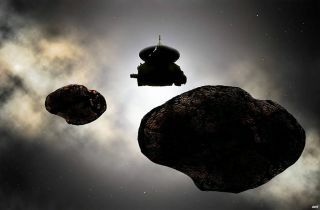 Artist's illustration of NASA’s New Horizons spacecraft flying by a possible binary 2014 MU69 on Jan. 1, 2019. Early observations of MU69 hint that the object is either a binary orbiting pair or a contact (stuck together) pair of nearly like-sized bodies with diameters near 12 and 11 miles (19 and 18 kilometers). NASA's New Horizons spacecraft will get three times closer to its next flyby target than it got to Pluto in July 2015, if all goes according to plan. Mission team members aim to steer New Horizons within just 2,175 miles (3,500 kilometers) of the distant object 2014 MU69 in the Jan. 1, 2019 flyby, NASA officials announced Wednesday (Sept. 6). "We're planning to fly closer to MU69 than Pluto to get even higher-resolution imagery and other datasets," New Horizons principal investigator Alan Stern, of the Southwest Research Institute in Boulder, Colorado, said in a statement. "The science should be spectacular." New Horizons' sharpest Pluto photos resolved surface features as small as 600 feet (183 meters) across. But a flyby distance of 2,175 miles should allow the probe to spot details just 230 feet (70 m) wide on 2014 MU69, NASA officials said. This superclose approach isn't set in stone, however: A backup plan calls for New Horizons to cruise 6,000 miles (9,600 km) from 2014 MU69, if the team spots debris around the object. The mission team has already hunted for such debris, during a recent globe-crossing campaign to observe 2014 MU69 blocking the light from several different background stars. Study of such "occultations" can reveal a great deal about the foreground body, including its shape and size. The occultation observations returned some intriguing data: 2014 MU69 may actually be two close-orbiting bodies, or two objects stuck together (what's known as a "contact binary"). These two objects (or two lobes, depending on the nature of MU69) appear to be about 11 miles and 12 miles (18 and 19 km) wide, team members said. Everything will become much clearer, of course, as New Horizons approaches, and then flies by, 2014 MU69, which lies about 1 billion miles (1.6 billion km) beyond Pluto. "Reaching 2014 MU69, and seeing it as an actual new world, will be another historic exploration achievement," New Horizons project manager Helene Winters, from the Johns Hopkins University Applied Physics Laboratory in Laurel, Maryland, said in the same statement. "We are truly going where no one has gone before. Our whole team is excited about the challenges and opportunities of a voyage to this faraway frontier." The $700 million New Horizons mission launched in January 2006. The probe captured the first-ever good photos of Pluto during its historic 2015 flyby, revealing a stunning diversity and complexity of terrain on the faraway world. The 2019 encounter with 2014 MU69 is the centerpiece of an extended mission approved by NASA last year.